External Review allows sending a request to review your course to any person, even if they don’t have Easygenerator account. Review is a premium feature. Therefore, if you are using the Starter or Pro Plan, you should upgrade to the Team or Enterprise Plan in order to read comments from external reviewers. Users of the Starter and Pro Plan can explore the review functionality by making the comments, but they cannot read them. You can send a request to review the course to any external reviewers, even if they don’t have Easygenerator account. Just click the External Review icon, copy the review link and send it to your reviewers. If you edit the course during the review process, make sure to click on Update course to apply the changes and make them visible to external reviewers. The reviewers can submit general comments or comment on a particular course page or question. 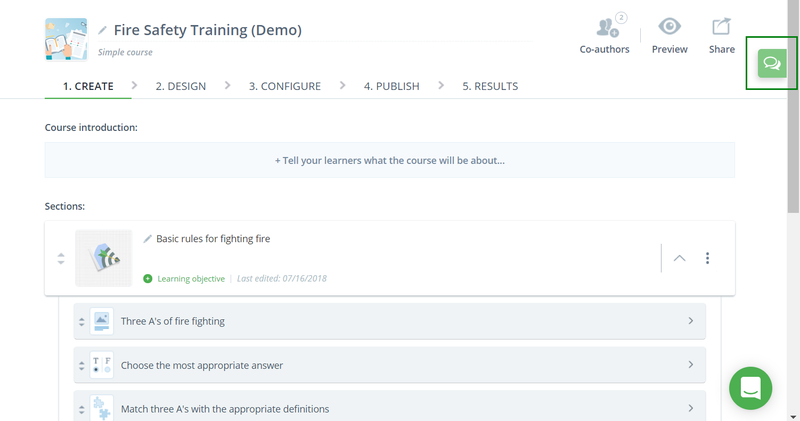 In the Comments window, you will see all the comments added to the course by a reviewer, the reviewer's name, the date and time when the comment was made, the corresponding page title (unless it's a general comment), and the comment status (resolved / unresolved). You can mark the comments are resolved / unresolved and permanently delete them.